People in the UK owed £1.616 TRILLION at the end of November 2018. This figure is up from £1.569 TRILLION at the end of November 2017 – an extra £898.71 per UK adult. 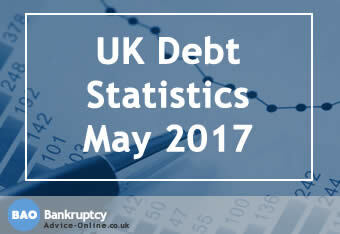 The average total debt per household – including mortgages – was £58,948 in November. That's an average debt per adult of £30,832 – which is about 112% of average earnings. Outstanding consumer credit lending was £215.4 BILLION at the end of November 2018. This is up from £206.2 BILLION at the end of November 2017, and is an increase of £174.80 for every adult in UK. This means at the average credit card interest rate it would take 26 years and 6 months to repay if you made the minimum repayments each month. UK banks and buiding societies wrote off £471 MILLION of loans and credit card debt to individuals in quarter 4 of 2016. That's roughly £5.1 MILLION a day. 3,001 consumer County Court Judgments (CCJS) are issued every day, with an average value of £1,337. 273 people a day are declared insolvent or bankrupt. This is equivalent to one person every 5 MINUTES 16 SECONDS.